Diving Deeper into the Active vs. Passive Debate. When investing, investors can choose either passively managed funds or actively managed funds. Passively managed funds invest in a portfolio that simply mirrors a market index. In contrast, actively managed funds have portfolio managers who attempt to outperform a market index by utilizing a particular investment strategy. Recent studies have shown that the average return of all actively managed funds within certain fund categories has failed to match the returns of passively managed funds. Passively managed mutual funds and exchange-traded funds (ETFs) also typically have lower expense ratios than actively managed funds, so it is not surprising that some investors have concluded that they would be better off investing exclusively in passively managed funds in all asset classes. However, we believe there are at least two flaws in this line of reasoning. First, in most of the studies the only asset class tested was large cap domestic equities. This ignores managers in other asset classes that may have more success beating their benchmarks. Second, these studies only indicate that it is better to use a passively managed fund instead of the “average” actively managed fund. However, this “average” fund performance includes many small funds with inexperienced managers in which no investment professional would likely consider utilizing for their clients. The HBKS® Asset Management team decided to dig deeper to account for both shortcomings. We began with the Morningstar database of more than 7,000 mutual funds. We then removed all funds with less than $100 million in assets under management and removed all funds whose primary portfolio manager has been managing the fund less than five years. We then separated the funds by the asset class categories listed in the chart below. We believe performance comparisons should only be made over a market cycle, so for each fund we calculated the three year annualized returns for each calendar year-end going back 20 years (from 1996 through 2016). For each of the 20 periods, we calculated the average fund performance within each category for those funds that had performance during that entire period. Since it is impossible to invest directly in an index, we compared our results to a passive Exchange Traded Fund (ETF) that seeks to replicate the primary benchmark within each asset class. We then substituted the index performance within any category that the ETF did not have enough history to fill out the 20 periods. The results paint quite a different picture than the studies that simply use the average returns for all active domestic large cap funds. Outside of the large- and mid-cap domestic equity asset classes, the elimination of smaller actively managed funds and those with short management tenures substantially improves the probability of selecting a fund that outperforms its benchmark over the long run. The analysis indicates that there is a high probability that utilizing active management will add value in many asset classes. One possible reason for this is that in some markets, information is much harder to obtain, so it is far more likely that an active manager can gain an information advantage versus other investors in these markets. The results also show the market environment is an important factor to consider when deciding between active or passively managed funds. During periods where the market posts negative returns, the probability that an actively managed mutual fund with long-tenured managers and at least $100 million under management will outperform a passive strategy is 50 percent or better in every asset class. It appears that, even in the large- and mid-cap domestic equity asset classes, active management can help lessen the short term drop in assets when the market turns sour. This is particularly important in the current market environment. For the past eight years, stocks have been on an almost uninterrupted march higher with very little volatility. However, stocks are reaching valuation levels that appear high by historical standards, the Federal Reserve has begun raising short-term interest rates, and geopolitical risks are increasing. For these reasons, many experts expect modest returns over the next several years in most asset classes, possibly between 0 and 10 percent. The column on the far right of the table illustrates what the historical probability of out-performance by funds with long-tenured managers and at least $100 million under management. 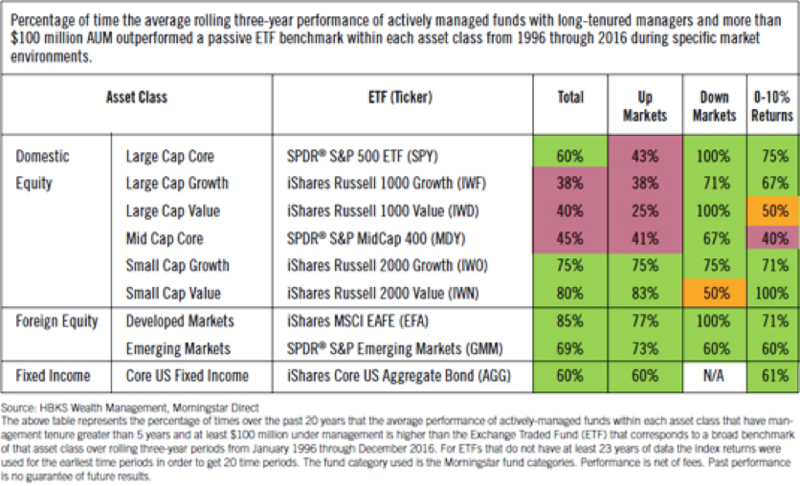 In this market environment, the average of these funds has outperformed the passive ETF quite often in most asset classes. This may mean the market environment over the next several years will favor active management. Of course, our process in selecting which actively managed fund we include in our clients’ portfolios is much more involved than what is described in this article. Within each asset class, we look further into the manager’s process, philosophy, and discipline. This helps us identify those managers within this group who have a disciplined process that is repeatable and are most likely to continue posting superior performance. 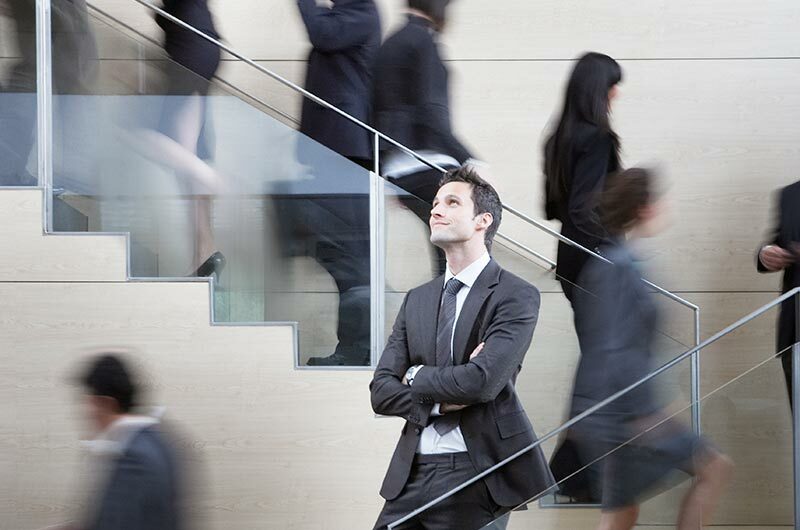 At HBKS® Wealth Advisors we recognize the importance of utilizing both active and passive management. For example, active management is much more likely to pay off in the domestic small cap, foreign equity, and fixed income asset classes. Domestic Large-Cap Core and Domestic Mid-Caps, on the other hand, are very efficient markets where it is very hard to gain an informational edge. As a result we use passive management in those asset classes. We believe this approach can add value versus a purely passive portfolio, while keeping overall costs much lower than a purely active methodology.